A Wheeler's Opinion: Why Ateneo won't Win in the Finals against La Salle? The Blue Eagles are aiming for a possible sweep of the elimination rounds heading into their last 2 games: one of them is against La Salle. Sure, Thirdy Ravena soared up for a posterizing dunk in the dying minutes of the Blue Eagles' 102-83 victory against the still winless UST Growling Tigers. Sure, the Blue Eagles were able to keep their undefeated slate with 2 more games to play. Sure, they can relax a little bit against the UP Fighting Maroons whom they will face next on Wednesday but knowing Tab Baldwin, he wouldn't do it. It's not in his character especially being recognized as an international coach. And if you're facing a team like the Maroons, you should play as if you're playing against the Ben Mbala-led Green Archers of La Salle because in case you haven't been watching the UAAP, UP has accumulated 5 wins this season: one of them is against the Green Archers themselves so UP is not the team that Ateneo should be laughing at especially if they want to go straight to the Finals. Now, La Salle, despite not being the who is on a verge of sweeping their way into the Finals, remains as the favorites to repeat as champions. Why? For one, they have the reigning MVP, Ben Mbala who is averaging 26 points per game this season and nobody in the league can match-up against him. Another reason why La Salle is still a better team than Ateneo is Ricci Rivero. Rivero has been playing impressive basketball aside from his high-flying dunks. 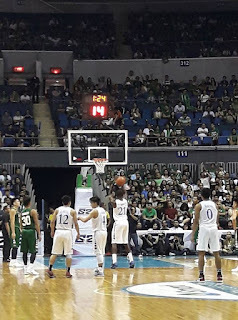 Sure, Anton Asistio can knock down three after three after three but when it comes to athleticism, that's where Ricci Rivero comes into the picture. In fact, it was Rivero's 19 points that led the way for La Salle against the Blue Eagles back in their first-round encounter which Ateneo won, 76-75. If there's one team who is capable of going to the Finals aside from the defending champions, it's the Blue Eagles. Why? They surprised everyone last season when they reached the Finals when everyone thought they wouldn't even reach the Final 4. They were also the only team to beat La Salle last season. And they gave La Salle everything they had during the Finals and despite La Salle winning the championships thanks to the heroics of eventual Finals MVP Jeron Teng, everyone knew from that moment, Ateneo will be back in the Finals. The question is: Can they finally get over the hump and beat La Salle? Sure, Chibueze Ikeh has been playing his best season with the Blue Eagles but Ben Mbala won last season's MVP for one reason: he caused the biggest problems for his opponents. Sure, you can throw two or even three defenders against Mbala but given the fact that La Salle is also loaded with perimeter shooters, it's not a strategy any coach would employ regardless of Mbala's performance. Ateneo may have an emerging Ikeh plus an improving Isaac Go but defending Mbala is entirely a different thing. Big Ben may have scored 18 points against Ateneo back in the first round but we all know he can score more and we can expect to put up an MVP performance come the second-round encounter between both teams on November 12, 2017. And he will be haunting Ateneo should both teams meet again come the Finals. If there's one thing that could doom Ateneo's chances of winning the championship for the first time since the Norman Black era, it's their bad habit of letting their opponents stay within striking distance before finally stepping on the accelerator late in the game and breaking the game open. This was visible during yesterday's game between Ateneo and UST where the Growling Tigers were actually within 5 points during the early goings of the Finals until Ateneo stepped on the gas and were never threatened the rest of the way. The good thing was: it was only UST. It could have been worse had Ateneo was playing against La Salle. And Ateneo can't play this way most especially against La Salle because whether Ateneo likes it or no, they were lucky against La Salle back in the first round. They allowed the Green Archers to actually take the lead in the 4th quarter only to win it thanks to a sorry La Salle turnover plus a pair of charities from Mike Nieto. Regardless if Ateneo sweeps the elimination rounds or not, we can expect both Ateneo and La Salle to meet again, at least two more times after November 12. For the Blue Eagles, it's simple: Shut down Mbala and clamp down on defense and you beat the champs. Let the Archers hang around and you can say goodbye to a thrice-to-beat advantage in the Finals.